They were dependable, quick, and gave me an accurate and fair estimate. I flip houses, and they worked on my own home. They did such a great job that I knew who to call. There were a couple of little things that needed to be done, and they fixed them without an extra charge. We had a serious leak, and Tom came out and repaired it. Throughout the torrential rains this year, it hasn't leaked once. He was personable and straightforward. He tells it like it is. Tom was great. He came out around ten times, because it was such a big project. He was very responsive, and he put in a huge effort to try and figure out what the problem was. He didn't give up. Tom responded to my calls quickly, and I was always in the loop. He was very pleasant, friendly, and easygoing. The other workers on the job were wonderful also. 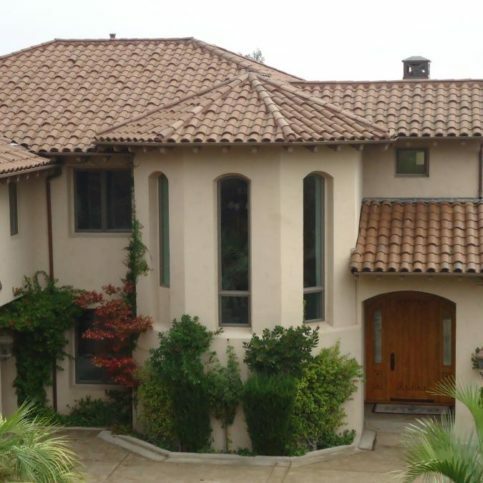 Roof-Life Construction installs, repairs, and maintains a wide variety of roofing systems (including composition shingle, tile, slate and TPO) for residential and commercial clients throughout Contra Costa and Alameda Counties. The company also has the training and equipment to install gutters, sheet metal, attic insulation, skylights, and solar power systems, and it backs all its workmanship with a 10-year warranty. Roof-Life Construction also offers a comprehensive gutter cleaning program called the Overhead Care Club, which includes everything from a 15-point roof inspection to downspout flushing and debris removal. For more information about the company’s wide-ranging services, Mr. Rhoads invites potential customers to visit www.rooflifeinc.com. Areas Served: Serving Contra Costa and Alameda Counties including San Ramon, Alamo, Livermore, Dublin, Orinda, Pleasanton, Moraga, Danville and Lafayette. 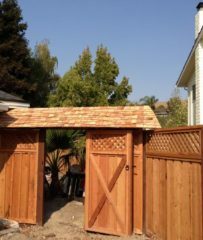 Roof-Life Construction installed these custom redwood and cedar gates. 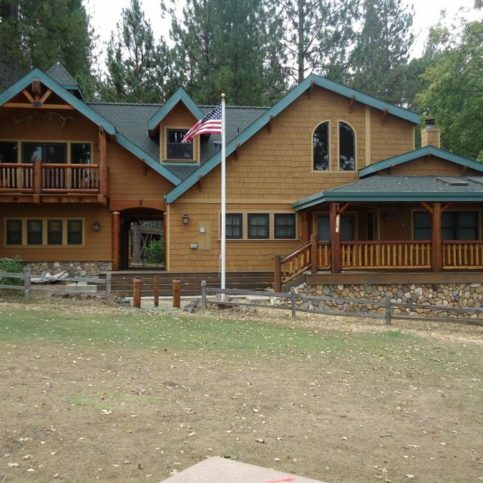 Roof-Life Construction has been installing, repairing, and maintaining all types of roofing systems (including composition shingle, tile and slate) for residential and commercial clients throughout Contra Costa County since 1986. The company is also qualified to install gutters, sheet metal, skylights, attic insulation and solar power systems, and it provides a 10-year workmanship warranty on every job. The same is true for roofing underlayments, which are unseen layers that fit underneath tiles, shingles and other visible roofing materials. Underlayments used to be made of asphalt-based felt, which would break down over time—especially if they got wet. Now, synthetic underlayments are available at a fraction of the price. “Synthetic underlayments are much easier to work with and stand the test of time, so they’re worth the extra expense,” says Mr. Rhoads. Q: How long will it take to complete my roofing project? A: It depends on the extent of the work, but we’ll include that information with our written proposal so you know what to expect. Our start dates are firm during the summer, but they can fluctuate in the winter because rain impacts our ability to work. Q: Are you certified to install roofing products? A: Yes, we’re certified to install GAF and CertainTeed products, which benefits our clients because we can offer extended warranties that ensure better installations and longer protection against defects. Q: Can you suggest the right roofing system for my home? A: Absolutely. We’ve worked on many custom homes over the years, so we have a lot of experience helping people find roofs that best fit their homes. For example, if your house has a lot of bricks on the exterior, you probably shouldn’t go with a light colored roof, and if you have a colonial-style home, you may not want a wood roof. Q: Can you give me some addresses of previous clients so I can see your work in person? A: Yes, we can tell you about local homes in your neighborhood that we’ve reroofed. If you see a roof that you like, let us know—we can educate you about that particular roofing system and recreate it on your home. Roof-Life Construction installed this clay two-piece tile roof. This concrete S-tile roof features random boosters. Roof-Life Construction is available to perform emergency repairs day or night. Tom Rhoads is a 33-year veteran of the roofing industry and president of Roof-Life Construction, a Diamond Certified company. He can be reached at (925) 338-7472 or by email. A: The San Francisco Giants, the San Francisco 49ers and the Golden State Warriors. A: Rock. I also like rhythm and blues. Q: What was your favorite Halloween costume as a child? Tiles located on hips and valleys of your roof are the most likely to become dislodged. Fortunately, these can easily be reinstalled using an adhesive and/or being drilled and re-nailed. Located around roof ventilation pipes, rubber collars are an important component of leak prevention. Depending on the type of flashing present, you can usually remedy the situation by removing the old collar and slipping on a replacement. However, in some cases, replacement of the entire flashing is necessary. The intersections where two tiles come together are by far the biggest problem areas on a tile roofing system. A big part of the problem is sunlight, which erodes the sealant and membrane between the tiles. While annual resealing will keep these areas in good repair, for a more permanent solution, you should consider installing lead flashings. An inevitable problem with tile roofs is when debris builds up under valley intersections, which is a common source of leaks. To remedy this, you’ll need a roofing professional to clean the debris out of the valley and re-form the curves on the outer side. One preventative upgrade to consider is installing a triple-crown metal, which will allow the water to form down three channels instead of one. 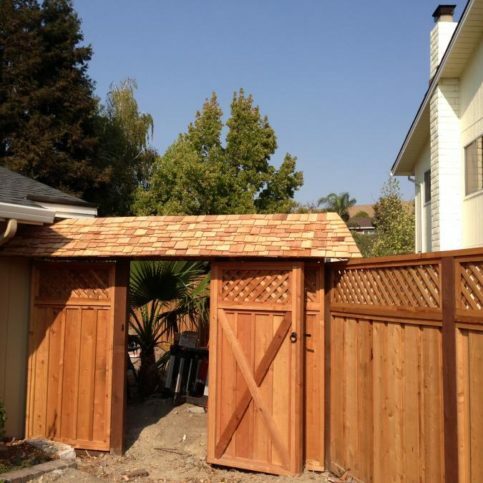 SAN RAMON — Host, Sarah Rutan: If your home has a tile roof, make sure you’re aware of its specific maintenance needs. Today we’re in San Ramon with Diamond Certified Expert Contributor Tom Rhoads of Roof-Life Construction to learn more. Diamond Certified Expert Contributor, Tom Rhoads: Today we’re going to talk about roof tile maintenance. It is important to maintain your tile roof system and drainage system annually. Let’s talk about a few things you can do to keep your roof system functioning for years to come. Most importantly, keep your roof clean. Removing debris and leaves from your roof system is by far the most important thing that you can do. Now that we can see the roof, let’s talk about a few things that you can do on your checklist. Look for slipped or migrated tiles. These tiles are usually found on the hips and valleys. They can easily be reinstalled by adhesive and/or drilled and re-nailed. Also look out for cracked rubber collars. These collars are found around your vent pipes. Depending on the flashing itself, you can easily repair this by slipping a new rubber collar over and sometimes replacement of the whole flashing is necessary. Let’s talk about tile intersections: where the two tiles come together is by far the biggest problem area on your roof system. On your trim tiles, meaning the ridge tiles or rake tiles, a lot of times the sealant has been compromised by the sun. It cracks and it breaks away, and/ or the membrane that they use at the top would be burned away by the sun as well. Installation of a lead flashing in place of those is a permanent fix. Now let’s talk about your valley intersections. The biggest problem. The debris buildup under your valley is the most common source of a leak. This problem will require a roofing professional to come clean the debris out of the valley, re-form the curves on the outer side, and/or an upgrade to that would be to install a triple crown metal, which allows the water to form down three channels instead of one. If you follow these basic tips, you should have no problem keeping your roof system alive for years to come. Roof-Life Construction : Average 9.6 out of 10 based on 54 unique customer surveys of customer satisfaction. They did what they said and explained it to me clearly. Tom was one of the easiest going and easiest construction people to work with. He was spot on. The ease of working with Tom, he was personable and upfront. I would tell them to use Roof-Life. I actually did that, and one of my neighbors got roof put on by them about a month after mine. Tom, the owner, is a straight-shooter and a good guy to deal with. They did quality work and were responsive. They were efficient, friendly, and did a beautiful job. I would tell them that they are amazing, reliable, and quick to respond. They are affordable, easy to get a hold of, and work quickly and efficiently. I would recommend them. They did an excellent job. If you ever need service for rooftop repair, I would definitely recommend them. I would use him again in a heartbeat and refer him out. He worked around my schedule, the pricepoint, and he is a great guy, as I've known him for a long time. If you want the best in the business, he's the one. Tom took care of everything. He noticed an issue when he first came on board, and he was on it. The customer service was great. I have and would recommend him to others. They were reliable, dependable, prompt, and professional. 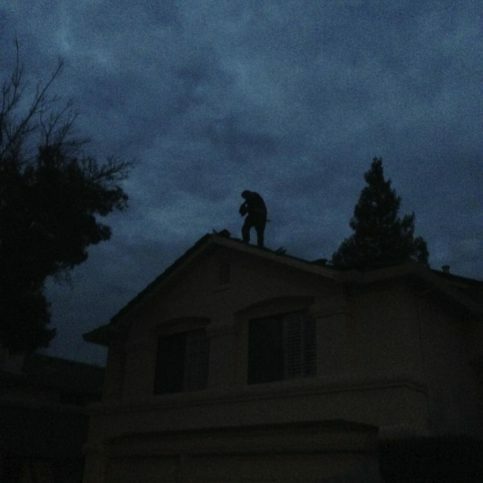 Tom even got me on the roof to show me what needed to be done. I would tell people not to look anywhere else and go with Roof-Life. They were very efficient, and Tom did a fantastic job. Tom was honest and always there for me. They have fixed my roof several times over the years, and they do a top quality job. I would tell people to definitely call them. I appreciated the fact that Tom was always there for me if I needed anything. We had a leak, and Tom stayed with it until he found it.